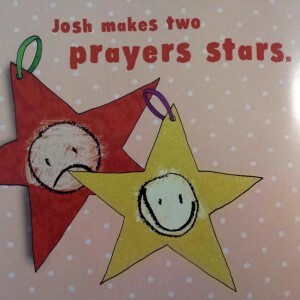 This activity comes from Josh stays in hospital, about how Josh has to spend quite a while in hospital, but discovers while God is with him and will help him. It’s part of the Held in Hope series produced with the Paediatric Chaplaincy Network. Draw faces on prayer stars to represent one sad prayer and one happy prayer. In the book, one is a sad prayer asking Jesus to stop his body hurting (again, non-specific illness), and a happy one to thank Jesus for being with him in hospital. This is easy to do with even very young children. Use different coloured card for the different stars, colours which represent sadness and happiness. In the book Josh hangs them on the Christmas tree, but they could be hung anywhere. You could make a little ‘tree’ out of a bundle of sticks. There are loads of other good ideas for activities to help children think about God and sickness and death in the Held in Hope books, including two pages of notes for adults with suggestions and guidelines. All the books are available here.